With additional reporting by Barbara Payne. Map courtesy of Andre Walker. (APN) ATLANTA — The remaining unincorporated areas of Fulton County, all located in south Fulton, are slowly being gobbled up by mostly under-the-radar annexations. The City of Union City annexed 8.2 acres and an additional one acre last year. Now, Union City is looking to annex more, while Atlanta, Chattahoochee Hills, College Park, and Palmetto are also seeking to further chip away at the remaining area that is unincorporated south Fulton. For the second year in a row, legislation is before the Georgia Legislature to create a new City of South Fulton that would incorporate any remaining unincorporated areas in Fulton County. Last year, the legislation was tabled in order to give time for any annexations to take place. Those annexations, as anticipated, are taking place, and do not appear to be stopping any time soon. “None of the residents are leaving; it’s the business owners that are leaving unincorporated South Fulton,” Andre Walker, blogger for the Georgia Unfiltered website, told Atlanta Progressive News. “Which obviously raises a lot of questions about the feasibility of the proposed City of South Fulton – how do we have a city that’s basically gonna have the budget balanced on the residents? Because the business owners are leaving in record numbers,” Walker said. “We’ve reached the point where a new feasibility study needs to be done,” he said. First, on March 18, 2014, Union City’s City Council unanimously approved an annexation petition of 8.2 acres on South Fulton Parkway into Union City, according to records obtained by APN through an open records request to Union City. On April 02, 2014, the Fulton County Board of Commissioners approved the annexation, in a vote of five to zero, with Tom Lowe (District 4) and Joan Garner (District 6) not voting. The annexation was part of a request by Majestic Properties to develop a new industrial project at Fulton County Airport-Brown Field, investing some 150 million dollars. The Board of Commissioners said the development was expected to bring about five hundred new jobs to Union City. Union City pursued a related second annexation later in 2014, for one acre on Stonewall Tell Road. Union City received the second annexation request from Majestic Properties on June 12, 2014, and sent a letter to the Fulton County Board of Commissioners on June 13, 2014. The Fulton County Board of Commissioners approved the annexation on July 16, 2014, in a vote of six to zero, with Tom Lowe (District 4) not voting. 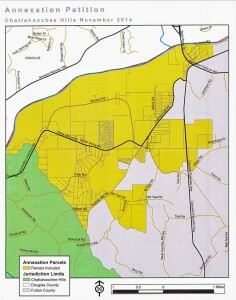 Union City is now pursuing a third annexation. Fulton County Board of Commissioners approved this annexation on December 03, 2014, in a vote of six to zero, with Liz Hausmann (District 3) not voting. On Thursday, February 26, 2015, Union City held a Special Call meeting for a public hearing and for the City Council to decide on Majestic’s third annexation proposal for Union City. The items were approved with conditions, Vanessa Campbell, an assistant city clerk, told APN. At first, the City of Chattahoochee Hills had sought to annex about 9,400 acres, according to a notice it sent to Fulton County on September 30, 2014. On October 15, 2014, the Board of Commissioners voted to notify Chattahoochee Hills that it could not approve its request because it said the city had not submitted copies of the necessary signatures to the County as part of its request. The vote was six to zero, with Tom Lowe (District 4) not voting. “Chattahoochee Hills originally was trying to annex about 9,400 acres, and they were 80 signatures short on that. So they didn’t move forward on the initial annexation petition,” Walker told APN. Chattahoochee Hills withdrew its request for the 9,400 acre annexation, and the Fulton County Board of Commissioners accepted the withdrawal on December 17, 2014, in a vote of four to zero, with Robb Pitts (District 2), Tom Lowe (District 4), and Emma Darnell (District 5) not voting. On November 25, 2014, Chattahoochee Hills announced public hearings on a new plan to annex 4,920 acres instead. Most of the land is owned by Carl Bouckaert, Walker said. “Fulton County received notice in a letter dated November 24, 2014 from the City of Chattahoochee Hills to annex approximately 4,920 acres of property in unincorporated South Fulton County,” the County stated in a summary of the proposed annexation legislation. “This annexation was presented to the Fulton County Board of Commissioners at the December 17, 2014 meeting. At this meeting, the Board voted to place an objection to the annexation based upon the proposed zoning and land use designations by the City of Chattahoochee Hills,” the County stated. The vote to object was four to zero, with Pitts (District 2), Lowe (District 4), and Darnell (District 5) not voting. “Subsequent to that date, Fulton County Planning and Community Services staff met with staff from the City of Chattahoochee Hills to discuss Fulton County’s objection. Based upon that discussion, the City of Chattahoochee Hills submitted amended language that addresses Fulton County’s land use and zoning concerns,” the County stated. On February 18, 2015, the Fulton County Board of Commissioners withdrew its previous opposition to the new annexation plan. The vote was six to zero, with Marvin Arrington, Jr. (District 5) not voting. On February 03, 2015, the City of Palmetto notified Fulton County of its receipt of the annexation petition from Willow Oak Landfill, LLC, to annex a landfill on Roosevelt Highway. At the February 18, 2015 Fulton County Board of Commissioners meeting, the Board approved the proposed annexation by the City of Palmetto of 26.793 acres. The vote was seven to zero. The Mayor and Council of Palmetto will consider the annexation petition tonight, Monday, March 02, 2015, at 7:30 p.m.
College Park is currently considering a proposal to annex 274.985 acres of what is mainly warehouses. On February 16, 2015, “Councilman [Tracey] Wyatt moved to set a public hearing on March 16, 2015 to consider annexation applications in the Naturally Fresh Boulevard/Buffington Road/Spur 14 area, seconded by Councilman [Ambrose] Clay and motion carried,” according to meeting minutes of the City Council of College Park. The Fulton County Board of Commissioners will consider the proposal this Wednesday, March 04, 2015, according to the meeting agenda. As previously reported by Atlanta Progressive News, the City of Atlanta is also pursuing annexation of the Loch Lomond Estates neighborhood. The neighborhood submitted an annexation petition; however, the City rejected it due to procedural reasons. It seems as if our honorable law enforcement agents have learned more than how to beat up protesters and kill color people in their trips to “ISreal” – Annexation is the core of the Zionist regime, something our enforcers and representatives appear to have learned from their Apartheid counterparts. Maybe it’s just me but this doesn’t explain why the businesses are leaving in droves. Where are they going? Are they moving to other incorporated areas away from Atlanta or are they figuring out if they are going to pay higher taxes they might as well be somewhere with more services. The title of the article doesn’t match the conversation of the article.